Super thin 4K TVs are proving popular at CES 2017 in Las Vegas, and Chinese electronics manufacturer Xiaomi is showing off one of its own at its first ever CES press conference. The Mi TV 4 is thin to say the least; measuring only 4.9 mm at its thinnest point, Xiaomi say it’s thinner than the iPhone. Just like the company’s highly anticipated Mi Mix smartphone, the Mi TV 4 has virtually no bezels making this TV a whole lot of screen. The TV runs Xiaomi’s own Patch Wall software, a skin on Android, which apparently uses AI to make intelligent recommendations for the next thing you should watch. The recommendations are based on things you’ve watched already, but the system draws its suggestions from a vast library of content rather than just one streaming service. An interesting feature of the Mi TV 4 is its modularity, something that was first introduced in the Mi V 3. This means you can easily change and upgrade its parts, whether it’s the display, the motherboard, or the sound system. 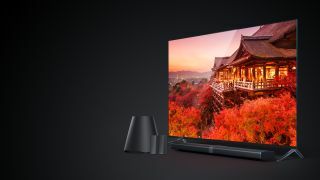 Unfortunately, Xiaomi has only confirmed that the Mi TV 4 will be shipping to China, where a 65 inch version of the TV with Dolby Atmos speakers will be available later this year for under $2000. 49 and 55 inch versions will also be available, presumably for even less. There’s no news whether or not Xiaomi will ship any of these products outside of China, but we’ll update if any announcement is made.